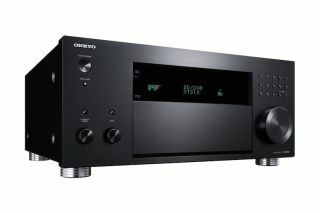 Onkyo launches new-look TX-RZ800 and TX-RZ900 AV receivers | What Hi-Fi? We've already brought you news on Onkyo's budget AV amp offerings for this year, but now it's time for the manufacturer's premium models to take centre stage. The first thing you'll probably notice from the pictures is that Onkyo seems to have moved on from the 'industrial' design of its most recent models such as the TX-NR3030, with a cleaner, dare we say more Pioneer-like approach to styling. Besides the new look, the TX-RZ800 (185W per channel) and TX-RZ900 (200W per channel) are Dolby Atmos-enabled and DTS:X-ready. "Ready" because the amps will work with DTS:X straight out of the box only if the relevant firmware update is ready roll before the new models go on sale. Otherwise they will have to be updated in situ. The 'RZ900 gets custom-designed electrical components honed for optimum sound quality, and a high-grade 32-bit/384kHz Asahi Kasei DAC. The new receivers are also THX Select 2 Plus-certified and feature 4K-ready HDMI inputs and outputs, plus wi-fi, AirPlay and Bluetooth. Spotify Connect and Deezer are both built in as well. And, as you'd expect at this level, there's full high-res audio support via DLNA, including playback for DSD and 24-bit/192kHz FLAC files. Onkyo has fitted dedicated speaker outputs for 'Height' effects should you want to put together a 5.1.2 Dolby Atmos configuration. There are also dedicated Powered Zone 2 outputs, so you can fire audio out to speakers in another room. Both the TX-RZ800 and TX-RZ900 are due to go on sale in August. Onkyo has also launched a 2.1 speaker system, the LS3200. Designed to be an alternative to a soundbar, the system featurs a slimline amplifier, with two curved and gloss-finished front speakers and a wireless, downward-firing subwoofer. The system can be wall-mounted with speakers positioned either horizontally or vertically. The amp is equipped with both optical and coaxial digital inputs and includes Dolby Digital and DTS decoding in addition to a special 'Voice Mode' that can elevate dialogue from movies and TV shows. The LS3200 goes on sale in August.